Boone, NC strongman Jon Glassberg has been having a pretty good last 12 months; sending several of his hardest problems and winning the Triple Crown event at Hound Ears. It would seem like he will only be getting stronger in the coming year. In order to assist everyone with following his progress, Glassberg recently joined the blogging bandwagon which you can read by clicking here. One post of interest already is his report on a recent comp he attended where competitors were able to grab cash off the wall as they got higher on a problem. 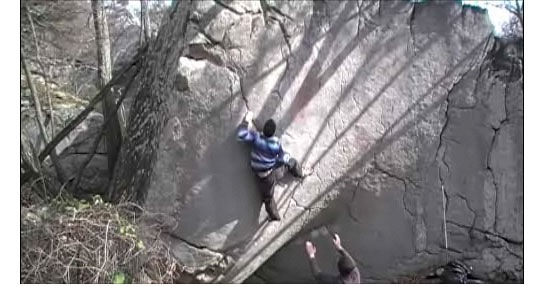 The Shield (V12) from Jon Glassberg on Vimeo. If you are looking for more motivational videos, Glassberg has several others on his Vimeo page. Featured problems include Golden Harvest (V10), Fred’s Roof (V11), The Orb Direct (V9) and many other hard problems from the southeast. a couple vids from the aforementioned Heart Of Steel comp where people were grabbing $$$ of the walls. i worked 80 hours that week to make that happen! Anyone know where a topo for LRC can be found? Heading there for spring break.